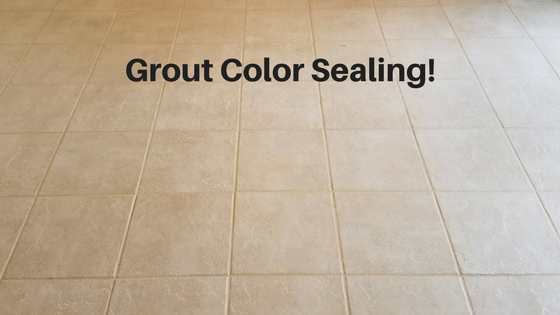 You are here: Home » alva » Grout Color Sealing – Make Your Tile Floors Look New Again! Grout Color Sealing throughout SW Florida GUARANTEED FOR LIFE! Grout color sealing, if performed by experienced craftsmen using top quality sealers, will transform the look of your tiled floors and should be guaranteed for life. Unfortunately, in the SW Florida market, many contractors offer to “color seal” your tiled areas but will not guarantee this service for more than a year or so. Is there genuine value in having your grout color sealed? The truth is, when performed by a quality contractor using a quality product and is willing to guarantee their grout color sealing service for as long as you own your home, there is a lot of value. The problem is some companies are touting this service yet doing nothing more than ‘painting grout’ with what amounts to house paint. Having your tile and grout professionally cleaned will remove dirt, oils, most spills, pet urine, and other contaminants. In the overwhelming majority of homes, a thoroughly exhaustive tile and grout cleaning are all that’s needed to make their floors look phenomenal. As grout ages and is subjected to pet urine, acidic spills, or simply not maintained properly, the grout can stain or become blotchy in places and no amount of professional cleaning can remove staining. Similarly, to spilling bleach on your favorite pair of blue jeans, the stain is permanent no matter how many times you wash those jeans. When professionally applied, grout color sealing is designed to hide blemishes and staining damage while making your grout look better than brand new. There are also aesthetic reasons for choosing color sealing. When you have areas where only some of the grout needs to be replaced, it is virtually impossible to match the color of the new grout to the older grout that is still intact. Even if you use the identical product and color, aging and wear have already altered the look of your previously installed grout and the difference is usually noticeable. Color sealing will provide a consistent look across the board, making all your grout look new again. Grout color sealing can completely change your grout to virtually any color you choose. The benefit of this is obvious. Are you considering new decor, an updated, fresher look or trying to restore the grout to its original color? Your existing grout doesn’t need to hold you back or limit your choices. Proper application using quality sealers and colorants that ensures complete protection over the entire surface of your grout is an art that requires training and practice to master. At Tru-Clean Carpet & Tile Care, our professionals not only have the training, experience, and tools to do the job correctly, they have access to a wide variety of professional sealers and can match any color you can dream of. Don’t be one of those homeowners who assume “all color sealers and companies” are the same. The quality of the product used coupled with the experience of the technicians and the guarantee after the sale is critical! Some companies —even some that may surprise you —are using products that are tantamount to house paint. It may look great right after they finish, but within a short time, the paint peels or cracks. Not only that, but this type of product does not have the properties of a proper color sealer, such as constant acting mildewcides or true stain prevention. Be sure to do your due diligence, and don’t hesitate to thoroughly question your prospective provider. For more information on our GUARANTEED FOR LIFE grout color sealing please visit us online at www.ForCleanCarpets.com or call us anytime at 239-541-4888. Grout Color Seal and Tile And Grout Cleaning Services Offered Throughout The Cities Of: Cape Coral, Fort Myers, North Fort Myers, Fort Myers Beach, Lehigh Acres, Alva, Buckingham, Estero, Bonita Springs, Naples, Marco Island, Captiva, Sanibel, Matlacha, Bokeelia, Saint James City, Punta Gorda, and Port Charlotte FL.